In the hospitality industry, keeping customers updated about the hottest new destinations and latest offers is of utmost importance. Potential customers and guests may not necessarily read a newsletter or brochure, but one thing is certain: they always carry a mobile phone with them and check their text messages. The smart reader might already expect where this post is leading. And yes, you’re right: It’s about how hotels and travel businesses can take advantage of latest technology evolution. Imagine a normal rainy monday: You are on the way to work and have to take the subway. At the entrance of the subway station is a promoter distributing brochures about vacation resorts. And now imagine you had received this promotional information as a text message on your mobile device. Which offer are you more likely to respond to? Let’s think about the brochure first: You are probably not going to take one because you don’t trust the promoter. And if you take one, you won’t read it, but throw it away within seconds. And the text message? A promotional text message is different. You cannot escape this marketing campaign. The possibility of saying “no, I don’t want one” simply does not exist. In comparison to brochure marketing and similar means, the mobile channel is significantly more effective, efficient and cost-reduced. Mobile technology obviously enables hotel guests to complete various steps on their smartphones and tablets, which effectively enhances customer satisfaction and brand recognition. Guests can do mobile check-in or check-out, enjoy concierge services using the hotel’s mobile application and much more. As crucial these features are for hotel guests: essential to hotels is their room occupancy. What makes a hotel manager more happy than being able to say “we’re fully booked”? 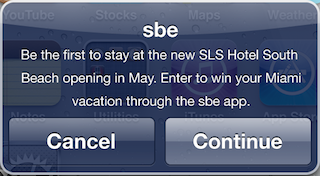 Mobile messaging can help hotels promote reservations. Guests who already stayed at a certain hotel can be targeted via mobile messages. For instance, they can be updated about seasonal special offers or openings of new hotels at new destinations. This is especially interesting for hotel chains. Have you ever been notified by a hotel about special offers? Would you like the hotel you’re staying at next to have a mobile application? PUSHTech™ multichannel platforms make sure customers are reached appropriately and enable travel agencies to send reservation information to both new and existing customers.